This case study of a bulk email marketing campaign demonstrates the huge value in creating content that customers WANT to receive. And remember that successful bulk email marketing doesn’t need large numbers, as this other small business email marketing case study also shows. 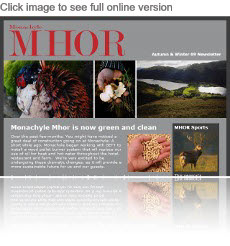 Our brief: create an occasional bulk email marketing campaign to promote the high quality and aspirational Mhor brand, and build on an already strong customer relationship. Part of the Mhor Group, Monachyle Mhor Hotel is situated in stunning countryside north of Callander (in the heart of Rob Roy country!). It has a tremendous reputation for high quality accommodation and dining, driven by owner and rising TV chef, Tom Lewis. Step 1: recommend to the client to include valuable content in the form of free recipes "from the kitchen of Tom Lewis"
What makes all Mhor bulk email campaigns interesting is their average open rate of 50%. The average open rate for a bulk email campaign is 20%, even using an opted-in bulk email marketing list. This is in no small part due to the inclusion in every campaign of a free recipe from Tom. Each Mhor bulk email marketing campaign includes a recipe that can be downloaded and printed or saved to the subscriber’s PC. Over time these recipes build into a collection. It’s really nice to see a bulk email campaign achieve success WITHOUT involving money. No discounts or BOGOF's here, just content that customers genuinely value. It’s crucial to getting not just one email marketing campaign opened, but many, and over a prolonged time. By the way, if you try the recipe let me know how it tastes. It sounds delicious!